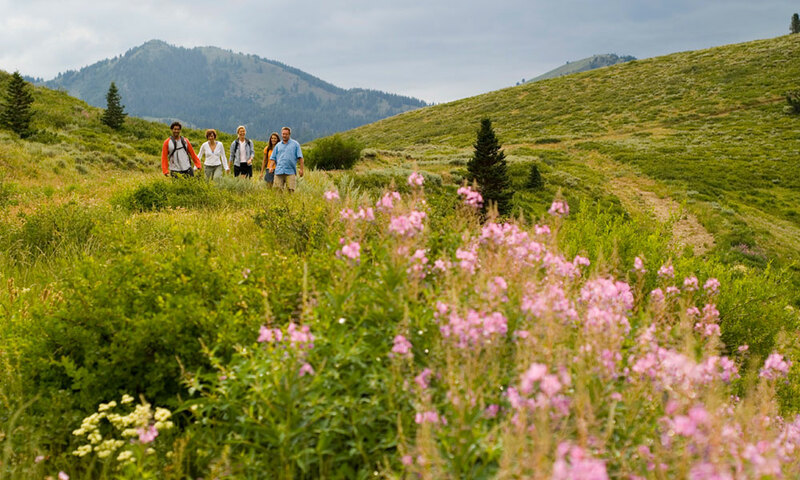 From sweeping views to technical trails, you won’t want to miss these Park City hikes. This relatively new trail is the perfect go-to for hot summer days. 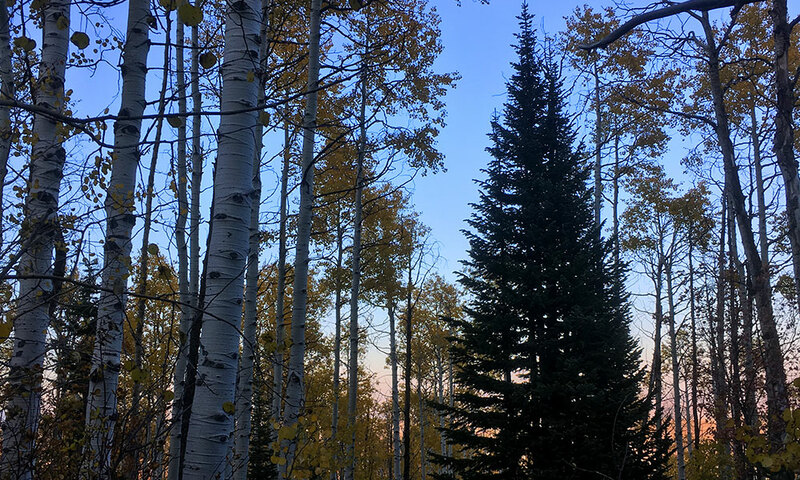 Begin at the Silver Star lift and wind your way up through the tall aspens and picturesque evergreens. On your way to the top, you’ll pass a few ski runs and the base of the King Con lift before reaching a clearing with a phenomenal view of the town. Along the way, you can choose between two shorter loop options: Dawns and H.A.M. Or, head to the top and continue on to the mid-mountain trail and down the Spiro Trail. This trail is ideal for hikers, as it’s limited to uphill bike traffic only. The best part of this trail, hands down, is that it starts and ends near the Silver Star Café, and there’s nothing better than celebrating a hike with a well-deserved post-hike beer and a delicious meal. Local Tip: Spiro is a popular downhill mountain bike trail. Keep your head up as you’re hiking. 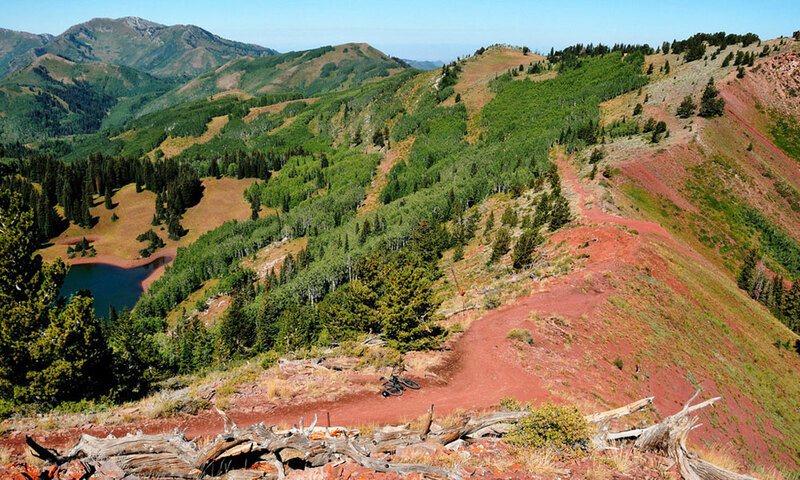 Also located at the ski resorts, the Mid-Mountain trail stretches 23 miles from Deer Valley, through Park City Mountain and Canyons, to just above the Utah Olympic Park. Tackle rolling hills through trees and across ski runs as you discover new views around every corner, all while hovering around 8,000 feet of elevation. And don’t fret, you can hike just a section of it if you’re not in the mood for a 23-mile hike. 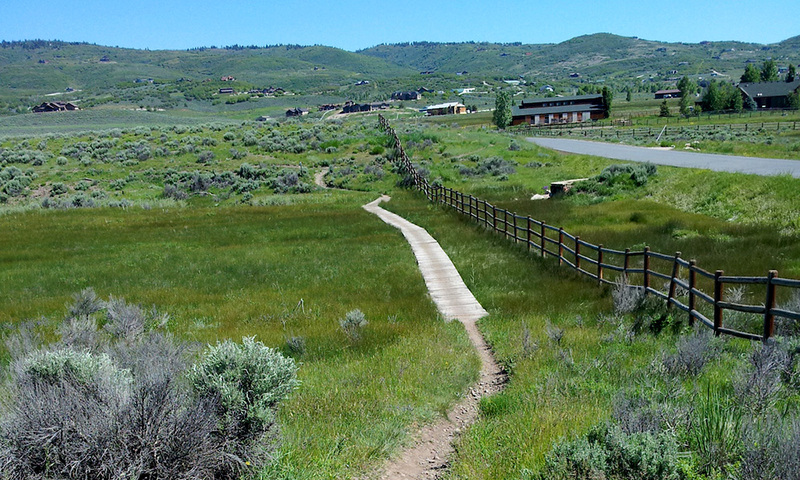 These short fun paths dip and dive their way around the Round Valley Protected Open Space. The motto here is “choose your own adventure,” as you’re sure to come to plenty of forks in the road and break-off directionals. As an added bonus, your dog will absolutely love it here, as they’re allowed to be off-leash throughout the park. Local Tip: Avoid these trails in the heart of summer, they are exposed and can get hot. 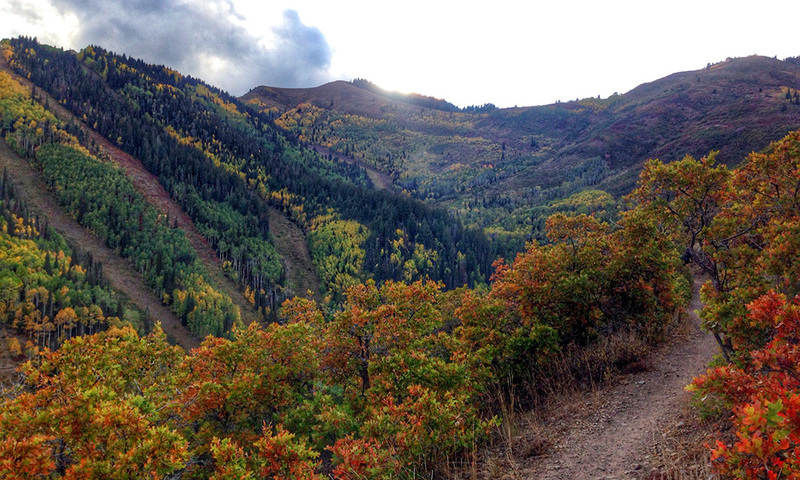 Starting at Bear Hollow Drive, this popular trail winds up the south side of the Utah Olympic Park. The wide smooth trail gradually works it’s way up through aspens and pines giving you glimpses of the surrounding resorts along the way. Plan an out-and-back or continue on to meet up with the Mid-Mountain Trail or Ambush Trail. Local Tip: Rob’s is limited to up-hill bike traffic only, making it a safer option for hiking. This local favorite is a popular after-work or weekend go-to. It’s a relatively short hike, but the elevation gain will definitely make your glutes burn. It’s well worth it. At the top, you’ll be awarded with a fantastic view of downtown and an ideally placed bench to admire it all from. We recommend doing it in early spring or the peak of fall to admire the aspen leaves. 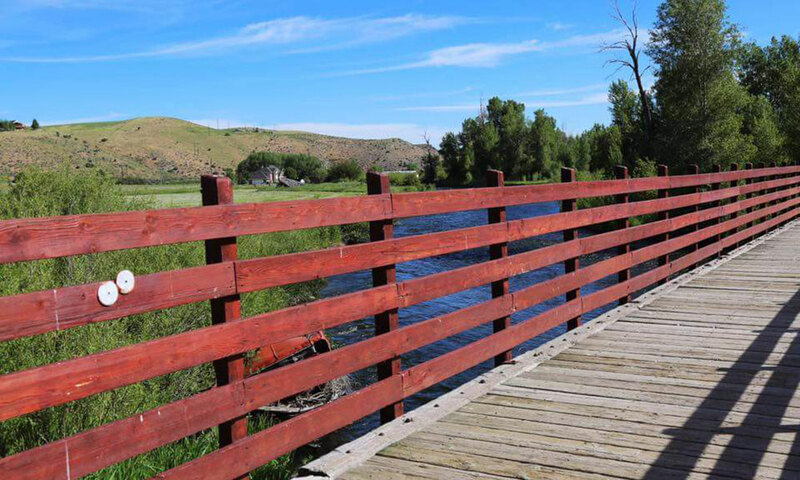 Located on the south side of I-80, these trails are popular for hikers, mountain bikers, and runners. Choose from a variety of out and backs or loops that wind through the green hills on the outskirts of town. Along your hike, find bridges, streams, and expansive views looking out towards the town or drop into the exquisite gated neighborhoods to admire the scattered mansions that will take your breath away. These trails are serious fun. 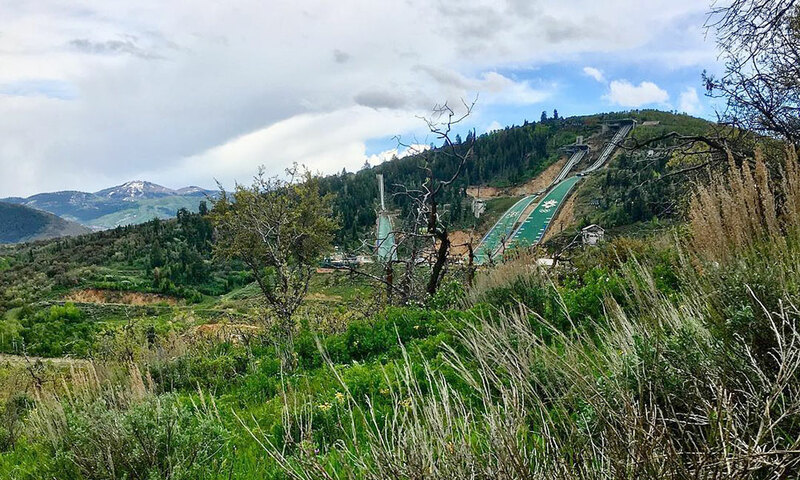 The single track winds through a large aspen grove as you make your way up to the Olympic Park where you can admire the ski jumps and bobsled track. Then, choose between several trails that branch off from the parking lot of the Olympic Park and head towards the top of the nearby hills. Here, you’ll get unforgettable views of the ski areas, the plains to the east, and the surrounding mountains to the west. If you have your pup in tow, the dog park at the base of the hill is off-leash and spans for miles. 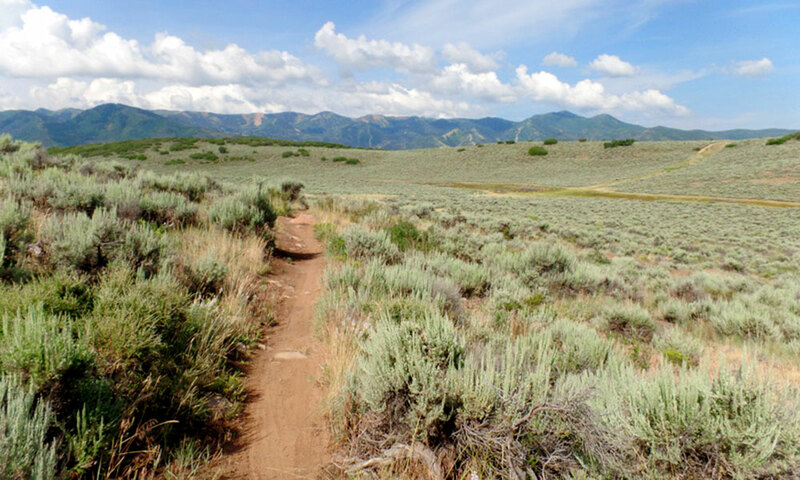 Completely non-motorized, this trail spans 28 miles from the neighborhoods of Park City to Echo Reservoir. Once a railroad used to transfer coal and silver, this trail is relatively flat and is the perfect place to get in your long bike ride, run, Nordic ski, or walk. Especially since along the way, you’ll find the iconic Union Pacific Bridge as well as expansive views of the Park City ridgeline. And, just like the mid-mountain trail, you don’t have to do the complete 28 miles to experience this trail. There are several access points throughout town where you can plan shorter out and back hikes. This short hike gets you some serious elevation fast. 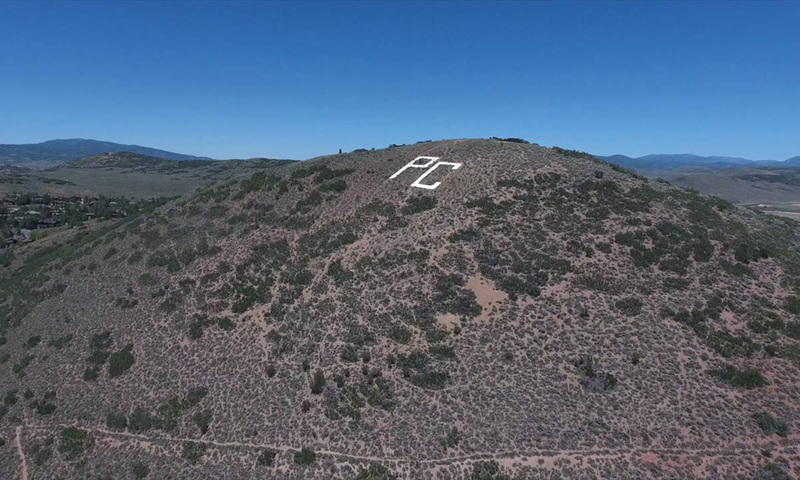 On the outskirts of town, opposite Park City Mountain Resort, this hike summits the hill with the giant white “PC” on it. Once you get to the top, take in the 360-degree view of the valleys and all the Park City resorts. If you’re looking for the perfect photo and don’t have the time for a full-fledged hike, this is the place to go. When there’s no snow on the slopes, the lakes come out to play. 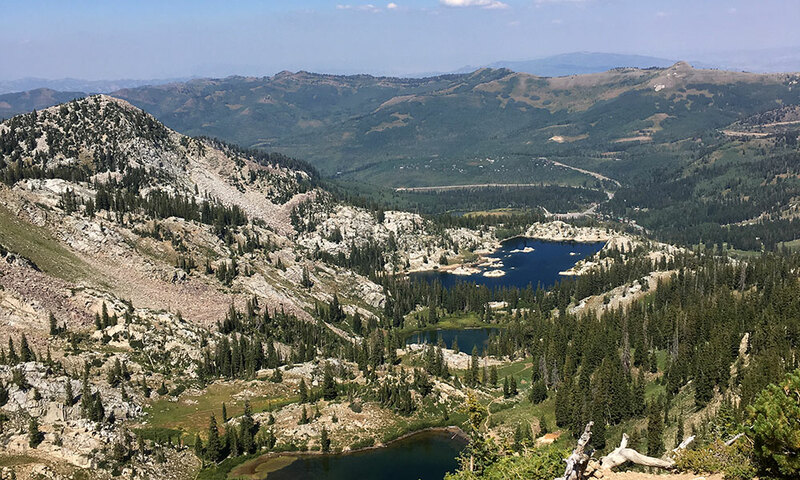 This hike takes you up the ski runs of Brighton Resort, through fields of wildflowers, and past three crystal blue lakes. 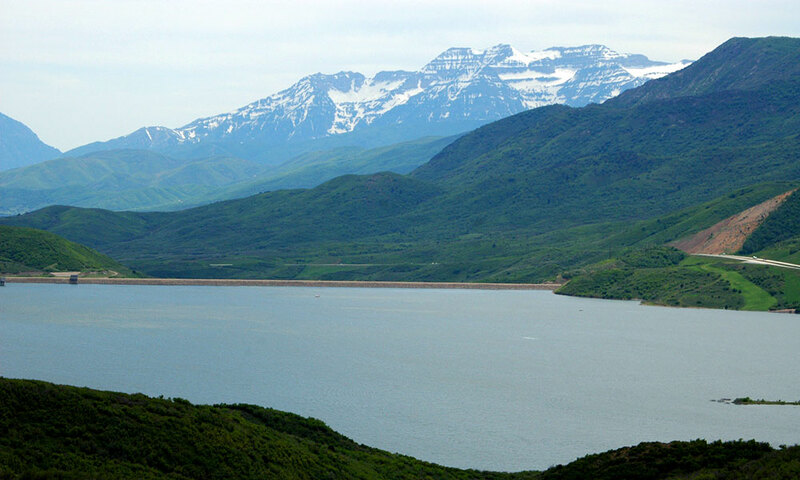 You can choose between wandering around the lakes or summiting the nearby peaks to look out over the Wasatch ridgeline. Local Tip: This hike is best accessible in the summer when Guardsman Pass is open. Check the UDOT site to see if you can easily drive there. Please note, the Cottonwood Canyons are watersheds and neither dogs nor swimming is allowed. This is the type of hike that will make your glutes burn and your lungs hurt, but damn is it worth it. You’ll gain an incredible amount of elevation in a short amount of distance as you tackle rock steps and steep hills. But, it’s all through a series of aspen trees and wildflowers. Just remember that the view at the top will make any memory of pain melt away. The minute you crest the hill, you’ll be greeted by an extraordinary glimpse of Sundial Peak. 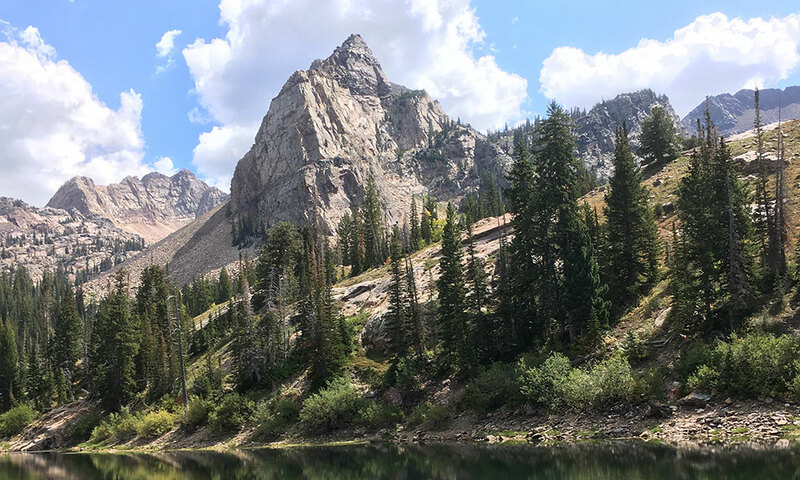 Hike even closer to get the classic picture of the peak reflecting off Lake Blanche or continue to follow the trail to see Lake Florence and Lake Lillian, which are far less popular but equally as beautiful. Local Tip: As with Mary’s Lake, this hike is best accessible in summer when Guardsman Pass is open. Dogs are not allowed in Big Cottonwood Canyon. Enjoy the beauty of this reservoir from every angle on the 9.1-mile trail that runs along the perimeter of the lake. Here, you’ll catch views of the blue water reflects the green hills and snowcapped peaks of Mount Timpanogos and the Wasatch range. This relatively flat trail makes it easy to get in the miles, or you can plan an out-and-back if you want to explore just a bit of the path. On hot days, head to the swimming area to jump in or rent a variety of paddle boards, jet skis, boats, and more from the Marina. 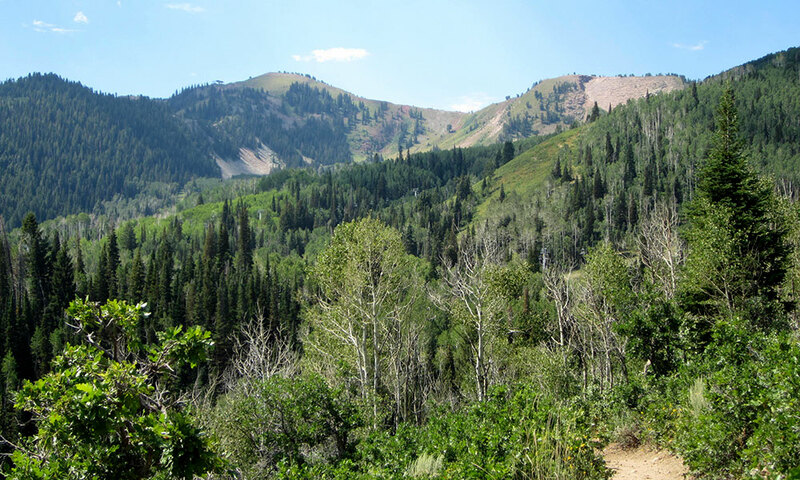 Boasting some of the best views of any hike in the Wasatch, this trail travels along the peaks of Park City’s ridgeline. From the top, you’ll get phenomenal views looking down into Big Cottonwood Canyon on one side and the town of Park City on the other. Set up a shuttle and hike it from point to point or plan an out and back. This is hands down the way to see the best views in the area and it’s worth the long hike. So, what are you waiting for? The mountains are calling. You should go.